If you and your family are looking for ways in which you can improve your home, you should consider constructing a new deck or porch. A custom deck or porch is a great way to enhance how you and your family use the outdoor spaces that are available to you. Vogel Home Improvement can help you with this entire effort. As a local remodeling contractor, I have extensive experience in porch and deck building in Anchorage. 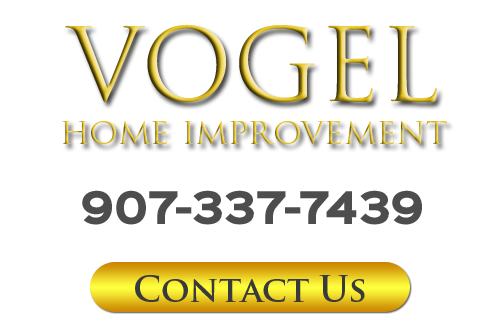 Since 1996, Vogel Home Improvement has been dedicated to providing the highest quality home remodeling services to each and every client. The focus here is on achieving the highest levels of customer satisfaction possible. When you hire Vogel Home Improvement to construct a new deck or porch for you, I will bring this dedication to excellence to task for you. Call Vogel Home Improvement today if you are planning to construct a new outdoor deck or porch around your Anchorage area home. I would be happy to take your call and to discuss your prospective project with you. As a local deck builder with years of experience under my belt, I can answer any questions that you may have about this type of work. Let's schedule your appointment today, and get started on your porch or deck building project! Constructing a new deck on your property is a fantastically rewarding home improvement project. You can create an area for your family to relax and enjoy the outdoor spaces around your home. Your new deck can be central to any gathering or entertaining that you do at your property. I would be excited to assist you with deck building in Anchorage. I can help you choose the best layout for your new deck, creating and easy transition between the inside and outside of your property. I can ensure that your new deck will be designed to accommodate every way that you want to use the area. You and your family will be pleased with the results of this deck construction project for years to come. One of the great aspects of living in the Anchorage area is the beautiful outdoors. When you construct a new porch on your property, you give yourself and your family an amazing space from which you can take advantage of your outdoor living spaces. As an experienced Anchorage remodeling contractor and woodworking specialist, I can help you create the perfect porch for your family's unique needs. With my assistance, you will make the most impactful and rewarding changes to your property. Your new porch will be a fantastic addition that will stand the test of time. 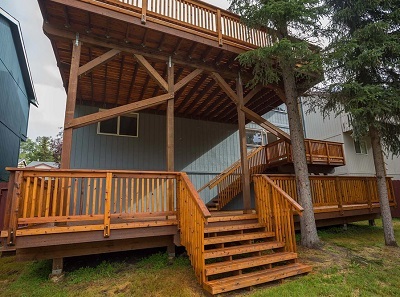 If you are looking for an experienced remodeling contractor that does porch and deck building in Anchorage, AK or nearby, please call 907-337-7439 or complete my online request form.